This video is on Bisbee Turquoise, Dillon and Nattarika Hartman have created this Bisbee Turquoise Video for your enjoyment and education on Bisbee Turquoise and Bisbee Turquoise Jewelry from Durango Silver Company. You will learn a lot from this Bisbee Turquoise Video and it is well worth watching if you are interested in authentic American Turquoise. Bisbee Turquoise Video - This Bisbee Turquoise Video has a lot of good information on Bisbee Turquoise with good video clips showing the different color ranges and charicteristics of Bisbee Turquoise. Bisbee Turquoise is rare and valuable, this video can help you distinguish if you have Bisbee Turquoise or not. Dillon also shows you some great Bisbee Turquoise Jewelry that was made or produced by Durango Silver Company. Durango Silver Company owns one of the largest Bisbee Tuquoise collections in the world and are authorities on Bisbee Turquoise. 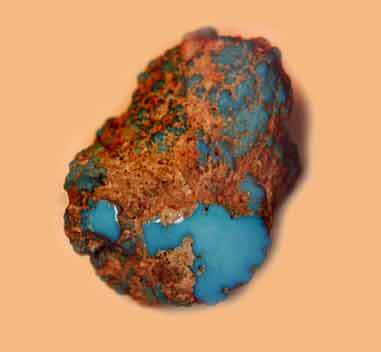 Above and to the left is a photo of a Bisbee Turquoise Rock that has been roughed out. 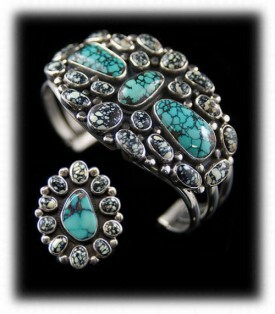 This is the type of examples you will see in our Bisbee Turquoise Video by Dillon Hartman of Durango Silver Company. This Bisbee Turquoise Video is very informative and intended to be an educational presentation for Bisbee Turquoise. We hope you will take the time to view our Bisbee Turquoise Video as we feel you will get a lot of knowledge from it. Above and to the right is an example of Bisbee Turquoise Cabochons similar to the ones you will see on the Bisbee Turquoise Video. 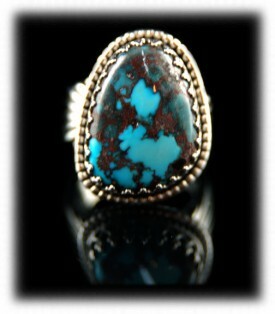 Bisbee Turquoise is known to be the finest Turquoise that has ever come out of he ground in North America. Our Video will educate you on Bisbee Turquoise and Bisbee Turquoise Jewelry from Durango Silver Company of Durango, Colorado USA. To the left is a Bisbee Turquoise Rings made by John Hartman of Durango Silver Company. This is a beautiful example of Smoky Bisbee Turquoise Gemstone set in a Sterling Silver Setting. This type of Bisbee Turquoise Jewelry can only be found from our company and John Hartman is a highly accredited Gold and Silversmith from Durango, Colorado USA. To the right is a Bisbee Turquoise Necklace in a Victorian Silver Setting by John Hartman. 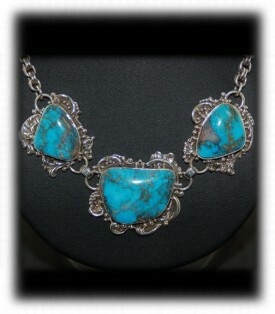 This Bisbee Necklace has three large stone with smoky - webby matrix in a beautiful medium blue colored Turquoise. The design is victorian scroll work the John is famous for. The upper left photo shows a Classic Navajo style, red spider web Bisbee and White Turquoise cluster bracelet and ring set by Native American artist Verdy Jake. This unique bracelet and ring set is truly one-of-a-kind. Both of the Navajo style cluster pieces feature RARE spider web Bisbee Blue Turquoise center stones surrounded by clusters of spider web Colorback White Turquoise. 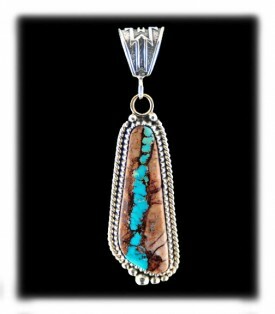 These spider web natural American Turquoise stones are separated by raindrops and rope in the classic Navajo tradition. Both sterling silver bracelet and ring feature heavy prong style shanks. This set of White Turquoise and Bisbee Turquoise bracelet and ring were Native American handmade in New Mexico, USA and are hallmarked "Verdy J. and Sterling". The upper right photo shows a Fancy Cluster Seven Stone Bisbee Turquoise Pendant by Vernon Begay. This Large Navajo Artisan Made Pendant features one large Natural Bisbee Turquoise stone surrounded by six Natural Bisbee Turquoise stones. Absolutely stunning! One of a Kind pendant with RARE and irreplaceable stones. These stones represent the classic Bisbee look. This sterling silver pendant was Native American handmade in the USA. We hope you have enjoyed our Bisbee Turquoise Video and you have obtained some good information that will help you understand more about Bisbee Turquoise. All of the Turquoise Earrings that we handle or produce at Durango Silver Company are handcrafted in the USA and have a 100% satisfaction guarantee. As our Turquoise Earrings are handmade, most are one-of-a-kind and cannot be duplicated. We work hard to have several pairs of our popular Zuni Earrings on hand, please remember they are handmade and may vary slightly. We invite you to shop online in our store by clicking on the category buttons on the left or by typing in your request in the search box to the upper left. Durango Silver Company Jewelry - Made in the USA - Built to last! We hope you have gained some useful knowledge from our Turquoise Earrings educational presentation page. We invite you to learn more about Silver Jewelry, Indian Jewelry and Turquoise Jewelry by following the links in our Learning Center which has many other informational pages that we have written on topics related to Southwestern Silver Jewelry. In addition, we would like to invite you to join our E-Mail Newsletter - about once every other month we send out a Newsletter to inform our members of what's happening with Durango Silver Company, new products, specials for our members and more. We also have a monthly drawing from our members toGiveaway free Turquoise Jewelry from our company. Please take a moment to become one of our friends and future winners in our giveaway by signing in below.